The weaver on a hand loom and the one who sets up the power loom (harness or " Jacquard") must have some guide or design to follow so that the warp threads may be threaded through the proper heald and the proper heddles on the "harness" loom, and the cards for the "Jacquard" properly cut and operated for each pick of the filling. For this purpose, designs are worked out on paper which is divided by heavy lines into blocks of eight rows or squares each way. Each vertical row of squares represents one warp end and each horizontal row of squares one pick of the filling; when working the design, if it is desired to show that warp end 1 passes over pick 1, a mark is made in the lower left hand square of the block, to indicate that warp 1 is on top, the next square above is blank, showing that warp end 1 is beneath pick 2, and so on; wherever it is desired to show that a certain warp is on top of a certain pick, a mark is made in the square where these cross and a blank square indicates that pick is on top, warp underneath. Weave may be divided into three fundamental classes - plain, or tabby, twill, and satin. Plain or tabby weave is the simplest that can be used, and is made by passing the filling over each alternate warp end, i.e., 1, 3, 5, 7, etc., in the first pick and under the others, 2, 4, 6, 8; the next pick will be exactly the opposite, passing over ends 2, 4, 6, 8 and under ends 1, 3, 5, 7; the third pick is the same as the first and the fourth the same as the second, and so on, thus making a plain weave (Fig. 5A). FIG. 5. 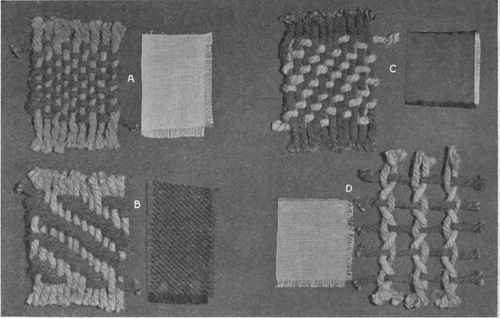 - Methods of interlacing yarns to produce simple weaves; A, Plain; B, Twill; C, Satin; D, Leno or Gauze. Twill weave gives a diagonal or twill line on the right side. Simple twill is made by passing the first pick of filling over warp 1 and under 2 and 3; over 4, under 5 and 6, etc., the second pick passes under 1, over 2; under 3 and 4, over 5; under 6 and 7, etc., the third pick passes under 1 and 2, over 3; under 4 and 5, over 6; under 7 and 8, etc. (Fig. 5B). Thus it will be seen that the filling passes under two warp ends, over one and under two, and that in each pick it passes over one warp in advance of where it passed over in the last pick, thus making a diagonal line through the cloth, and by passing always under two warp ends, more of the filling shows on right side than on wrong, as the latter is uppermost in the loom. Satin weave is made by passing the filling over a number (from four to ten or twelve) of warp ends and under one, over a number and under one, etc. In the next pick the filling will not advance regularly when passing under the warp as in twill weave, but irregularly. For example, in the second pick, the filling may pass under the fourth warp - in the third pick under the second warp - in the fourth pick under the fifth warp, etc. (Fig. 50). This gives the smooth warp surface of satin and does not show a definite line. If the method is reversed by passing the filling under a number of warp threads and over one, thus giving a filling surface, it is called "Sateen Weave"; this is generally used only for cotton materials and the "Satin Weave" for silk and wool. Leno or gauze weave is a fancy weave obtained by twisting or crossing each successive pair of warp ends between each two picks of filling. By this means, each warp end is always either on top or under every filling; for example, warp 1 is over pick 1 and warp 2 is under pick 1, then warp 2 crosses over warp 1 and passes under pick 2 while warp 1 passes over pick 2, they cross as before between picks and repeat; an additional mechanism is necessary on the loom to accomplish the crossing of the warp ends. This makes an open or gauzy weave as in marquisette or grenadines, and may be combined in stripes with plain or satin weave, or varied in many ways (FIG. 5D). Pile weaves, used for velvets, plushes, corduroy, Turkish towels, etc., is obtained by using two sets of warp threads, one for the ground or back of the material and one for the pile, which is looser than the ground warp and is worked by the loom in such a way as to be brought to the surface in loops of even length, which in the case of velvet and plush are cut through the center, thus making a thick, brush-like surface which entirely covers the ground. In corduroy, filling threads are used to form the loops; for Turkish towels the loops are formed by warp threads on both sides of the cloth and remain uncut.